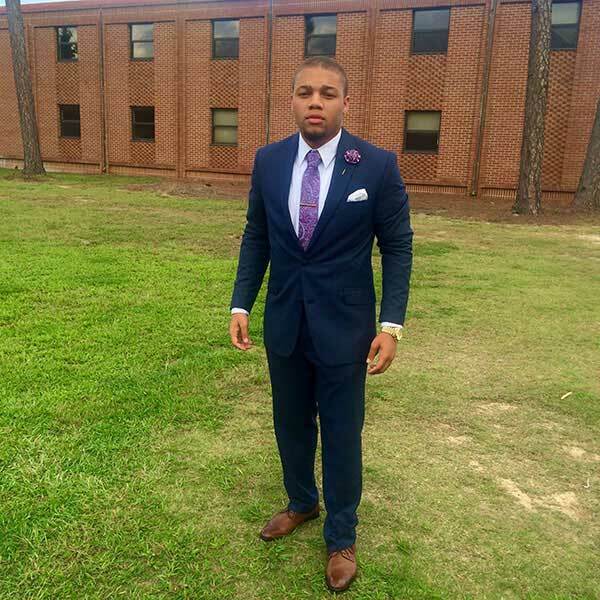 Math major Aaron Lewis, who aspires to a career in finance, is president of the Brothers of Leadership and Distinction student organization. High School: Northside High School, where he played football. Gerry Lewis (my grandfather & my conscience)." Degree Objective: Bachelor of Science in Math. Activities: President of B.O.L.D. (Brothers of Leadership and Distinction), Student Government Public Relations chairman, Resident Assistant, member of the Student Conduct Board, Campus Activity Board Community Service chairman. Career Goals: "I am considering actuarial science, accounting or financial advising. My long-term ambition is to become financially independent and use my time doing community service." He chose Middle Georgia State because … "When I was applying to schools after graduation, I was looking for a college or university that offered a degree in something that would correlate with my career ambitions. I also wanted to go somewhere that wasn’t too far from home. That way, my family could be on speed dial in case I needed them. Over time Middle Georgia State has become my second home and I hate being away." The one thing that surprised him about Middle Georgia State was … "There are a lot more opportunities available than what I anticipated. It's very easy to get involved with the university. If you want, you can do something to stay active and sharpen your skills every single day." His favorite professor is … "My first major involvement came through B.O.L.D. when I met Demetrius Smith and told him some of the ideas I had. He supported me one hundred percent and allowed me the opportunity to make my visions come into fruition. He is a great mentor and role model." His favorite place to study is … "My room is my place of solitude and peace. Being an RA gives me an extra room that I utilize to study. This is greatly beneficial because there are no distractions there, so I just maintain focus on my work." One thing people don’t know about him is … "I write poetry. I don't write as consistently as I would like. However, when I feel inspired, things usually flow pretty well for me." His friends make fun of him because … "I am actually somewhat shy to start with. They know that and will push me out of my comfort zone to be more outgoing." The one person he'd most like to meet is … "Malcolm X. The way he spoke and educated himself is motivating for me. He lived life with a purpose and I would just like to gain knowledge from him directly." Five years from now he sees himself ... "Having completed graduate school (maybe in finance), beginning my career, perhaps starting a family."